Mission Santa Bárbara was founded 4 December 1786 (10th in order) by Padre Fermin Francisco de Lasuén. 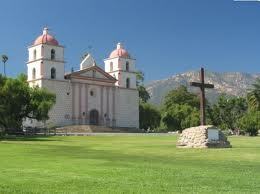 The mission is named for Saint Barbara and carries the nickname “Queen of the Missions” for its beautiful exterior (the Indian name was Taynayan). It is the only mission with two towers. Parts of the water system for the mission are still in use today by the city of Santa Barbara. The church is active.